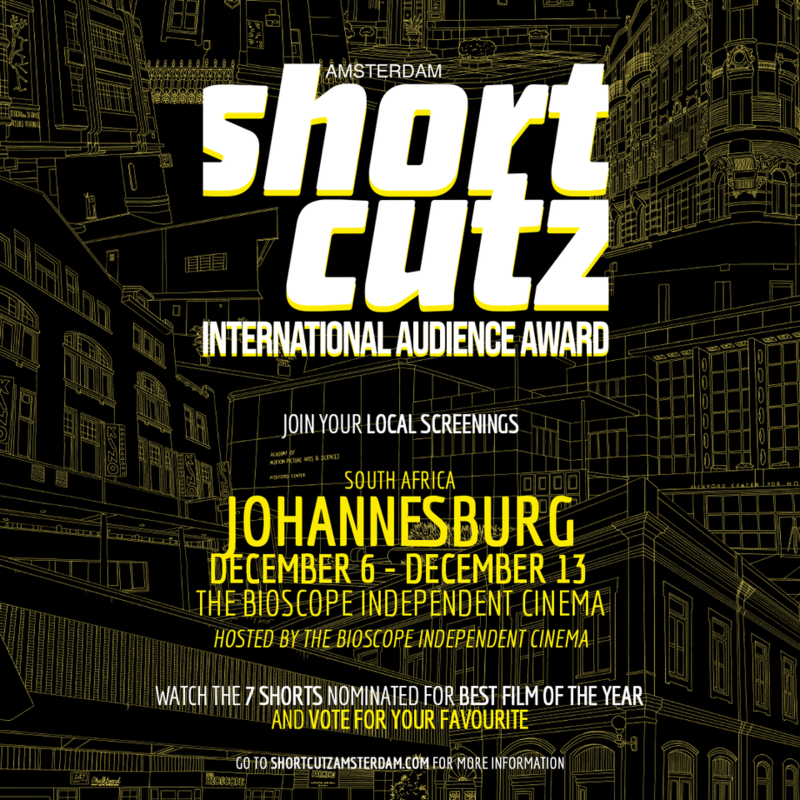 The Bioscope and RapidLion - The South African International Film Festival are proud to bring Shortcutz Amsterdam to South Africa. Shortcutz Amsterdam is an exciting platform for new Dutch filmmakers. They have weekly screenings in Amsterdam, where we screen two short films in competition from new Dutch film talent. At the end of each month, a jury team selects their favourite movie as the winner of the month. Their jury team is composed of actor Rutger Hauer (Blade Runner); producer Jan Harlan (The Shining), director Hany Abu-Assad (The Mountain Between Us), and many other established industry professionals. Then, they give the audience the opportunity to help choose the best in upcoming Dutch talent. For their Audience Award, they tour the world with their compilation of 7 short films (Winners of the Month), from December until the 17th of January, in more than 20 cities and 4 different continents. RapidLion and The Bioscope are excited to be included in this world-wide Shortcutz screening event. After screening the 7 films nominated for Best Film of the Year, every member of the audience is given a coupon to vote for their favourite movie. Shortcutz collects all the votes from all the participant cities (national and international) and announces the overall winner at the 6th Shortcutz Amsterdam Annual Awards - January 20th, 20:00 (CET) at EYE 1 (Dutch Film Museum). This gala will be streamed live on Shortcutz Amsterdam Facebook page. Frodo Kuipers | Animation | 5:30 minutes. 2. Sjaak’s Wife Died, So He Needs To Say Something. Eva M.C. Zanen | Fiction | 11:35 minutes. 76 year old Sjaak tries to write a speech for his recently deceased wife, but he is only capable of writing starters. When the ceremony begins, Sjaak postpones the speech. He has to find the true way to say goodbye to his great love. Heleen D'Haens, Eva van Barneveld | Documentary | 15:57. Where Romanian Miruna (14) lives, it is never really quiet. Not outside, where the people yell and fight, and not at all indoors. Miruna has twelve brothers and sisters who she has to take care of: cooking, doing laundry and folding it, comforting… for Miruna it is a fact of life. She barely gets to do her homework, and whenever she wants to study, she will have to do this in the midst of playing and fighting children. When Miruna thinks about her own future, she is certain about one thing: she wants things different and not like the other girls in her neighbourhood: marrying young and having children. Her dream is to become a police officer. The police visit her street regularly and the officers always maintain their calmness regardless of the situation, very different from people around her. Miruna would like to be this way too, but becoming an officer does not come easy. She has to get high grades in school and the entry exam is hard. How will she achieve this when she cannot even peacefully do her homework at home? A Vogue dancer performs at a Voodoo Carnival Ball, an important dance contest where he will have to prove himself to be accepted by the local ballroom community. He remembers growing up on Sint Maarten, a small island in the Caribbean and all the changes he has been through since. The freedom he longed for seems within reach. Based on the biographical story of Elvin Elejandro Martinez and narrated by him, ‘Otherland’ is a juxtaposition of two narratives that evoke new associations for viewers: while the visual story of the ball is fictional, the film is based on in-depth research into the Dutch ballroom community and all the characters and dancers are part of the European ballroom/vogue community. A troublesome relationship between a shopkeeper and his nagging mother results in a physical confrontation. The shopkeeper pushes his mother's wheelchair down the cellar stairs with her in it. Before he gets a chance to realise what he has done a gullible passerby enters his shop. A weird conversation about suspense cinema makes him reflect on his actions and take action. 6. To be awarded and announced soon. 7. To be awarded and announced soon.